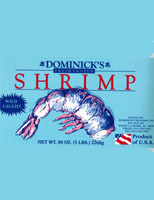 We offer the shrimp products below in all colors, with traceability, lab certification and 100% all natural quality. For more details about all available products and counts, please call 251.824.7962. 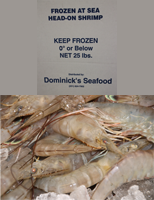 (IQF) This product is delivered fresh frozen in retail-ready packaging. 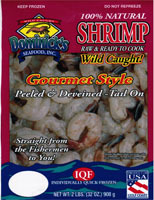 This premium quality shrimp is ideal for fine cuisine, comes in your choice of tail on or off. 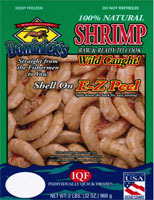 Shrimp arrive to your kitchen already split down the back for convenience of an easy peel. 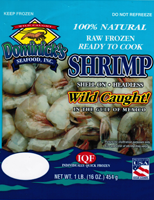 5lbs block of fresh frozen Gulf Coast shrimp with guaranteed quality and weights. 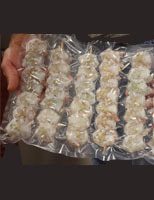 These 100% all natural shrimp are peeled and deveined before skewered and are available in a variety of sizes and weights. All natural 25lbs shatterpack, frozen at sea.